Chris from Pickup Some Creativity shares a tutorial on her blog showing how to make a pleated pocket for the inside of her Boxy Messenger Bag. She stitches it into the side panels, with the sides of the pockets getting caught in the side and bottom seams. Get the how-to. 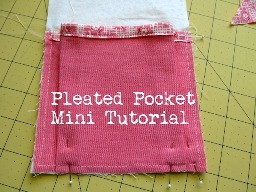 Is there any way to download the Pleated Mini Pocket in a PDF file?